And so after a rocky start this spring, hard-throwing rookie right-hander Bruce Rondon has pitched better lately. 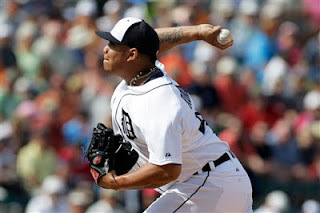 But in regard to the most important issue - by far -surrounding the Tigers entering the 2013 season, do we know any more about whether Rondon is capable of filling the closer role now than we did when spring training began? All that has transpired lately is that Rondon hasn't removed himself from the equation, which appeared to be the likely early this spring when he did a Ricky Vaughn impersonation from the movie "Major League." He does throw hard. He is striking out nearly two hitters per inning. But he throws too many pitches at this stage. It does appear less likely the Tigers will trade Rick Porcello for a closer. Drew Smyly has struggled. The Tigers need both Porcello and Smyly.Hitting prospect Nick Castellanos has increased his value by hitting well this spring and not making an errors in left field.. There are two ways to look at Castellanos. He is a extremely valuable chip for a trade, but he could hit himself out of that position if he gets off to a slow start this season, and his value drop. It all comes back to how desperate the Tigers are to trade for a closer. My gut feeling is Jim Leyland will not anoint Rondon closer. He will just be in the bullpen mix. Then the season will start, and Leyland will play it by feel. Before he came to the Tigers, I talked to a number of people who said what Leyland did best in the National League was handle his bullpen. For the most part with the Tigers, that has been true. Certainly he brought Phil Coke along properly last season when he struggled and it paid off handsomely in the playoffs. Leyland won't panic one way or another, but it's a precarious situation. Pat, I wouldn't, even though not perfect,worry about the pen. I am more worried abut the depth in the organization. I would not trade Procello unless it involves an everyday ss or super elite prospect that plays ss and is at AA already. Why, there is nothing in free agency at ss next year and nothing in our system that is close to MLB. I am a fan of B Ryan but at age 32 will his range start to decrease? His glove is why he is in the MLB.